XBiotech Inc. (“XBiotech” or “the Company”) is engaged in discovering, developing, and translating natural human immunity into novel therapeutic antibody products. These “true human” antibodies may enable faster development of potentially safer, more efficacious antibody therapies. 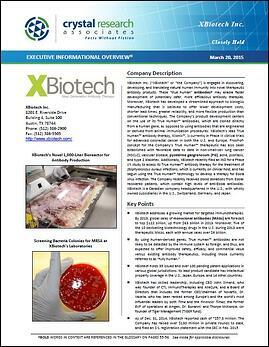 Moreover, XBiotech has developed a streamlined approach to biologics manufacturing that is believed to offer lower development costs, shorter lead times, greater reliability, and more flexible production than conventional techniques. The Company’s product development centers on the use of its True Human™ antibodies, which are cloned directly from a human gene, as opposed to using antibodies that are engineered or derived from animal immunization procedures. XBiotech’s lead True Human™ antibody therapy, Xilonix™, is currently in Phase III clinical trials for advanced colorectal cancer in both the U.S. and Europe. Proof-of-concept for the Company’s True Human™ therapeutic has also been established with favorable data to date in non-small-cell lung cancer (NSCLC), vascular disease, pyoderma gangrenosum (PG), acne, psoriasis, and type 2 diabetes. Additionally, XBiotech has launched a Phase I/II study to assess its True Human™ antibody therapy for the treatment of Staphylococcus aureus infections and has begun using the True Human™ technology to develop a therapy for Ebola virus infection. The Company recently received blood donations from Ebola-recovered patients, which contain high levels of anti-Ebola antibodies. XBiotech is a Canadian company headquartered in the U.S., with wholly owned subsidiaries in the U.S., Switzerland, Germany, and Japan. * The Corporate Snapshot was last updated on May 28, 2015.